We can produce products DN15-5000 diameter tube sheet with GB standard, American Standard, the Japanese standard, European standard and non-standard flange. Products are widely used in petrochemical engineering, food, metallurgy, construction, electric power and other machinery. Product quality and yield have been a qualitative leap. Tube plate is in a circular plate on the drill pipe diameter is slightly larger than the same hole, pipe penetration welded fixed, plays a role of such accessories. In the calculation of fixed tube plate in various working temperature to calculate casing axial stress, axial stress, heat pipe between the heat pipe and pipe plate pull-out force Q, one can not meet the strength (or stable) conditions, will need to set expansion joint. In the fixed tube plate strength calculation, when the tube plate thickness is determined, no expansion joint, sometimes tube plate set expansion joint, strength is not enough, the tube plate thickness could meet the requirements. At this point, it can also be set up to reduce the expansion section of thin tube plate, but from the material consumption, manufacturing, safety and economic results and other comprehensive evaluation. Fixed tube plate heat exchanger is widely used in U type expansion joint, which has simple and compact structure, good compensatory, cheap etc.. The tube plate machining accuracy, especially the tube hole spacing and diameter tolerances, verticality and smoothness have a great impact on the above assembly and use performance of chemical equipment. With the chemical equipment, power station of large, the diameter of the tube plate is becoming larger and larger, the diameter of the tube plate is very common 4m-5m. Large tube plate is characterized by a large number of tube holes, dense, small, deep, deep, precision and smooth finish requirements. The tube plate is widely used in heat exchanger, boiler, pressure vessel, steam turbine, large central air-conditioning industry. Mainly used for chemical containers, such as heat exchanger, pressure vessel, boiler, condenser, evaporator, central air conditioning, desalination, supporting fixed tube, metal material which not only has strong rigidity, but also has great heat conduction performance. Depending on the need to use the environment, the use of different materials, the general use of Q345R container board, such as the one or two pressure vessel, no corrosive media flow, using carbon steel composite plate. Have strong, high temperature and high pressure, such as nuclear power environment requires 16 stainless steel, manganese, corrosion resistance of titanium alloy material, the application of new synthetic materials, to the tube plate products bring new vitality. For tube plate three or four types of pressure vessels need high precision, hole processing method is the traditional fitter, rocker drill. With the chemical container of large-scale, the diameter of the tube plate is also increasing, the thickness is gradually thick, the tube sheet is also introduced into the numerical control technology, the use of CNC drilling hole with the rocker drilling hole processing. The use of machining center to do high efficiency and high precision machining has gradually been accepted by a number of large enterprises. Large thick tube plate in nuclear power, seawater desalination, and the central air conditioning heat exchanger area of the demand for a growing trend. In the detection process of tube plate, the main indexes are holes, diameter tolerances, roughness of hole, burr, slotting position and so on, for the double sheet detection process, pay more attention to the hole, two hole tube plate matching degree is very important. General use of CNC drilling machine can guarantee. 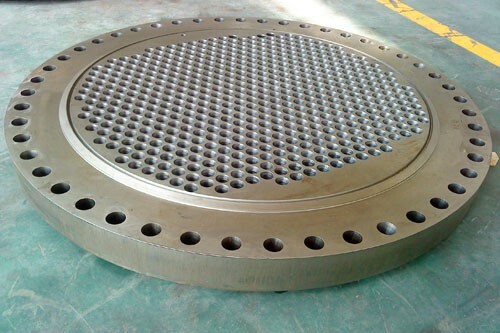 Relative to the plate, 300mm above the hole, the hole verticality is very important, the plate of large diameter, the need for tools and equipment more sophisticated, Longmen processing center special applications will be more and more common. A tube sheet is a plate, sheet, or bulkhead which is perforated with a pattern of holes designed to accept pipes or tubes. These sheets are used to support and isolate tubes in heat exchangers and boilers or to support filter elements. Depending on the application, a tube sheet may be made of various metals or of resin composites or plastic. A sheet tube may be covered in a cladding material which serves as a corrosion barrier and insulator and may also be fitted with a galvanic anode. Tube sheets may be used in pairs in heat exchange applications or singularly when supporting elements in a filter. Perhaps the best known use of tube sheets are as supporting elements in heat exchangers and boilers. These devices consist of a dense arrangement of thin walled tubes situated inside an enclosed, tubular shell. Tubes are supported on either end by sheets which are drilled in a predetermined pattern to allow the tube ends to pass through the sheet. The ends of the tubes which penetrate the tube sheet are expanded to lock them in place and form a seal. The tube arrangement forms a contained unit between the tube sheets. The tube sheets are then bolted to flanges inside the shell. The shell extends beyond each tube sheet and is sealed, thereby forming two closed chambers on the non-tube ends of the tube sheets. This creates an arrangement where the exchanger consists of two separate end chambers joined by tubes which pass through an isolated space between the tube sheets. Heated fluid is then passed from one end chamber to the other through the tubes where cold fluid in the cavity between the tube sheets absorbs the heat energy. The design of tube sheets is a fairly precise and complex process; the exact number of tubes needs to be established and a pattern of holes calculated to spreads them evenly over the tube sheet surface. Large exchangers may have several thousand tubes running through them arranged into precisely calculated groups or bundles. Sheet design and production is largely automated these days with computer-aided design (CAD) software performing the calculations and the tube sheet drilling done on computer numerical control (CNC) machines. The tube sheets used in heat exchangers and boilers are often clad with an insulating layer which also serves to protect against corrosion. To further protect the tube sheet from rust, a sacrificial or galvanic anode may also be attached to the surface of the sheet. Tube sheets are also used on cartridge-type filter devices to support the individual filter elements. They are similar in design to the high heat boiler varieties except they are typically made of resin composites or plastic and are generally used as single units. There are usually fewer tubes involved in a filter application although the tube sheet design still has to be carefully calculated to ensure optimal performance. The Fixed Tubesheet design consists of two stationary tubesheets attached to the shell. The bundle of straight tubes are connected between the tubesheets and contain baffles to direct the flow around the tubes in order to generate the required heat transfer. A head assembly is attached to each tubesheet. The U-tube design consists of straight length tubes bent into a U-shape with both ends terminating at the tubesheet. The tube bundle is fitted with supports or flow baffles. The tubesheet/tube bundle is placed in the shell and bolted between the head flange and body flange. A head assembly is required to direct the fluid into and out of the tube bundle. This configuration allows for the entire tube bundle to be removable. A Floating Tubesheet design is similar to the Fixed Tubesheet design except one tubesheet is allowed to move axially within the shell while the other tubesheet is fixed. Bendel Heat Exchanger ProgramThis configuration also allows for the tube bundle to be removable. Bendel is here to serve you and provide the highest quality custom built Shell & Tube Heat Exchangers to meet your application requirements. One of the most common heat exchangers in service within industrial process applications is the “Tube Sheet Heat Exchangers”. They are available in many shapes, sizes and have been used in industry for over 150 years. In this exchanger group are various sub design types: Fixed, U-tube and Floating tubes heet. Variations of all can be denoted as type “E”, “F”, “G”, “H”, “J”, “K” or “X”. The main applications are where high pressure/temperatures are key considerations. Loosely, general designs consist of the/an outer shell in which resides a tube bundle (these can be configured as finned, plain etc) sealed at each end by a tube sheet which isolates the tubes and the outer shell. Tube Sheet Heat Exchangers have the capability to transfer large amounts of heat at low(er) costs. This, in principle, down to both design simplicity and effectiveness – large tube surface for reduced weight, volume of liquid and importantly floor space. Whilst there is a wide variety to choose from there are certain key components similar in all. Tube sheets have tubes attached to them within the body or “shell” of the heat exchanger. The tubes allow the movement of a given medium (gas/fluid) through the shell chamber stopping it mixing with a second fluid medium that lies outside these tubes. As long as there is a temperature difference between these, in effect, the two flow past one another exchanging heat without ever mixing. Tube sheets can be fixed or floating dependent on the application the heat exchanger is designed for. Tube sheets are a critical component of the final design. There are a multitude of materials they can be manufactured from. Material selection is made after careful consideration as it is in contact with both fluids. It must therefore have the necessary corrosion resistance, electromechanical and metallurgical properties associated for its given working environment. The tube sheets themselves contain holes drilled into them. This, in a given, very specific design configuration, at very precise locations with critical tolerances. The amounts of holes can range from a few to thousands. These pattern or “pitch” holes are relative to each other tube sheet within the shell. This pitch changes tube distance, angle and flow direction. These parameters have been varied to maximize the heat transfer effectiveness. Tube Sheet Heat Exchangers of the big advantages of using a shell and tube heat exchanger is that they are often easy to service, particularly with models where a floating tube bundle where the tube plates are not welded to the outer shell is available. Fixed Tube Sheet Heat Exchangers used on fixed tube sheet heat exchangers. Tube Sheet Heat Exchangers the right choice of materials they can also be used to cool or heat other mediums, such as swimming pool water or charge air. Fixed Tube Sheet Heat Exchangers ideal cooling solution for a wide variety of applications. One of the most common applications is the cooling of hydraulic fluid and oil in engines, transmissions and hydraulic power packs. Tubesheets square measure one in all the foremost vital parts of Shell and Tube Heat Exchangers. These components square measure sometimes made up of a spherical flat piece of cast materials that square measure machined with holes trained for the tube ends in an exceedingly precise location and pattern relative to 1 another. Tube holes are often trained and reamed and may be machined with one or additional grooves that greatly will increase the strength of the tube joint. Fabrication Our workshops are equipped with fashionable machineries together with CNC drilling machines so as to create any quite tube sheets. These components square measure wide used for fabrication of warmth exchangers in any configuration. All machining activities like shaping machine machining, drilling, reaming, taping, grooving, and surface edge are often disbursed specifically in keeping with clients drawings and specifications. As all of drilling activities is programmed laptop and done by state of art CNC machineries, there wouldnt be any potential mistake caused by human. Any size and form of tube sheet wont to build a TEMA or maybe non-TEMA sort are often provided. Our drilling facilities that square measure equipped with deep drilling mechanism square measure able to drill terribly thick plates straightly while not deviation from acceptable tolerances. The strict use of top quality staple is secure and evidenced by staple certificate with every delivery. Material vary is varied from standard steel to steel, all grades of stainless-steel, non-ferrous (Brass, Al-Brass, Copper Nickel) and big selection of Clad Steel consisting of corrosion resistant materials. Non Ferrous: ASTM / ASME B169, B171, SB 564 UNS 2200 ( NICKEL 200 ), UNS 4400 (MONEL 400 ), UNS 8825 Inconel (825), UNS 6600 (INCONEL 600 ), UNS 6601 ( Inconel 601 ), UNS 6625 (INCONEL 625), UNS 10276 ( HASTELLOY C 276 ), SB 160 UNS 2201 (NICKEL 201 ),SB 472 UNS 8020 ( ALLOY twenty ) SB sixty one UNS C 92200, SB 62 UNS C 83600, SB 151 UNS 70600, 71500, C 70600 ( Cu -NI- 90/10), C 71500 ( Cu -NI- 70/30), SB 152 UNS NO C 10100, C 10200, C 10300, C 10800, C 12000, C 12200.